The Wildview TK40 No-Glo is a pretty basic entry level trail camera. It has functional standard features and you cannot expect fancy options in this model. It has simple switches to let you change between the functions available. This device is a no glow trail camera, and presents one of the best value for money no glo cameras on the market today. One good thing about this camera is that it is very user friendly. Because of its simple design, it is also uncomplicated to set-up. This camera also has a picture counter in the front that lets you know how many photos were already taken. You are also able to choose between 30 and 40 LEDs which is pretty cool because you can control the amount of lights it puts off which will help increase the battery life. This is useful especially at night. The Wildview TK40 No-Glo is also one of the most affordable ‘No Glow’ trail cameras available in the market. It is not much, but the objects are visible. This camera is not so ideal if you are planning to use it for security purposes. One negative thing about this camera is that it has a slow recovery time. If you are scouting game, then it will be difficult to capture movements. This is because the wild moves quickly and your camera could not capture it as swiftly. This camera is good if you are monitoring fields or food plots as they do not need as quick trigger time as for scouting purposes. I compared other trail cameras, and another trail cam that offers similar features is the Stealth Cam STC-P12. 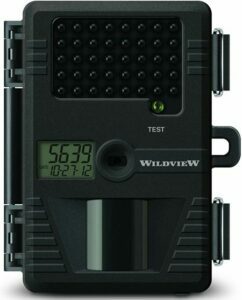 In conclusion, the Wildview TK40 No-Glo trail camera is good option for budget-concerned users. It offers you features for the price that you pay for. If you are looking for to do something more with you camera, then you can check out other options that are available.